Sorry, that's it – the Golden Joystick Awards 2016 voting has closed, with millions of people worldwide voting for their favourite games, developers and personalities of 2016 over the last few weeks. Some categories are split by a handful of votes, and there's sure to be a mixture of surprises, laughter and under-the-breath swearing when the winners are unveiled on November 18th, at the Indigo at the 02 in London. 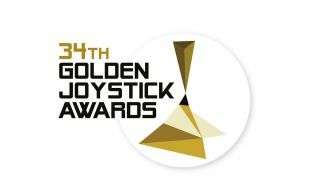 You can watch the winners revealed on November 18th via the Golden Joystick Awards 2016 live stream. Broadcast begins at 3pm GMT / 7am PST / 10 am EST. Please be sure to bookmark the page, or subscribe to the GamesRadar+ YouTube channel for more details. The awards are a chance to celebrate your favourite games, see a few famous developers and personalities in the flesh (well via a TV… but closer than you do while playing a game) and catch a few surprise video reveals – but we can't say more for now. Stay tuned to GamesRadar+ for more details, and thanks to everyone who voted in the Golden Joystick Awards 2016: the world's biggest public-voted games awards, now entering its 34th year. *If you voted in the Golden Joystick Awards 2016, but are yet to claim your three games for £1 / $1, you can do so until November 25th, 2016. To repeat, this only applies to people who have already voted – and, sadly, it's too late to vote now – but simply head to goldenjoysticks.greenmangaming.com to receive your 'Golden Pack' for just £1/$1/€1. On top of this great promotion, you'll be able to get your money back in Green Man Gaming credit if you play Spec Ops: The Line**. Voters will be able to claim their games on Green Man Gaming until 25 November 2016. If you voted before 3 October 2016, you will still be entitled to the Green Man Gaming promotion. Instructions on how the claim the ‘Golden Pack’ will be sent to you via email shortly. * You need to be 18 or over to buy the game. ** You will need to link your Steam and Green Man Gaming / Playfire account before you play the game to be eligible.